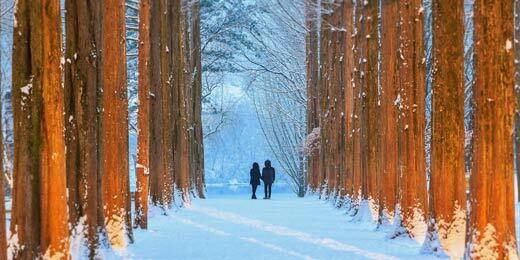 Namiseom Island is entertaining visitors during winter with the romantic Snowman Festival. Namiseom Island is an excellent place to visit, especially in winter, as it boasts several amusing attractions. For its very first time, Namiseom Island has turned into a “Snowman Village.” The village will be filled with exciting activities, such as snow sledding, bobsleigh tube, curling, and snow slide. An icebreaker crossing the frozen Bukhangang River and a miraculous ice-wall photo zone will also provide great souvenir photo opportunities. The popular Ice Carving Competition will also take place at the village; anyone is invited to participate and registration is available on-site at the event venue. Family-friendly activities like wishing tree experience and making a snowman are also available. For those looking for fun, but can’t brace onto the cold temperature outdoors, there’s nothing to worry about! Head on to Idle Land, located at the center of Namiseom Island, to enjoy indoor activities like making snowman candles and writing snowman cards. Namiseom Island’s festive atmosphere will continue until February 2018. Don’t miss this opportunity to visit the winter wonderland “Snowman Village” at Namiseom Island! ☞ Directions (Namiseom Ticket Booth & Namiseom Ferry Dock): From Gapyeong Station (Seoul Subway Gyeongchun Line), take a taxi for approx. 5-10 min. ※ Take a ferry to Namiseom Island from Namiseom Ferry Dock (Gapyeong Wharf). ※ Foreigners can avail discounted price of 8,000 won. Passport required. ※ Admission fee includes the round-trip ferry and admission to Namiseom Island. Activity and service fees within the island are charged separately.